I’ve had encounters like this so many times. I’ve seen so many people come alive when they think about their writing and then something happens and they seem to deflate. It’s as if we pop our own balloon–we keep ourselves small and unable to fly. I know this feeling not only because I’ve seen it in other people, but also because I’ve felt it myself and had to work to overcome it–a work that is at its core countercultural, because we’re not expected to take our full stories seriously, especially as women. But if we don’t take our stories seriously, what is lost is not only our writing but also ourselves, and in losing ourselves we lose so much, not only for ourselves, but also for the ones around us whom we love and for the larger world. If we don’t step into and claim our full stories, we can’t access our true power and be the agent and voice for the kinds of change and ways of being we want to see in the world. The world is full of all kinds of stressors; we may feel overwhelmed; and then we may feel that we need to soothe ourselves by retreating and not looking at anything else stressful—which our own stories themselves can sometimes be. But the best way to meet the world is to be grounded in ourselves, to not need to hide within ourselves, to show up for ourselves so we can show up for others. Getting our own story straight, giving freedom and value to our voice, and integrating our mind and body gives us the stamina and centering we need to be our fullest selves. Today I want to share a very personal essay that I wrote about how I came to embrace my own difficult story. I also want to tell you about some upcoming events. My online writing class Align Your Story with yoga and meditation is designed to help women step into the fullness of their stories and their writing voice and to overcome that voice that asks us “who do we think we are.” This course is open for enrollment only once a year and we’re starting April 26th! This is a space for women to explore their full stories with the support and inspiration of a sisterhood of other women. And once you sign up you can go through at your own pace and have lifetime access! Please reach out to me if you have any questions about either of these upcoming events. And now I want to share with you an I wrote several years ago for Spirituality & Health Magazine; it’s about my own bumpy path to accepting my full story; about how listening to other people’s stories helped me to heal and grow; and about how finally learning to embrace my story led me to do the work I do today. I hope sharing my story will be of benefit to you. As always, I love to hear from you. And please share this with any friends who might like it. You can also read it at my blog here. When I first came into conscious contact with the violence of my early childhood story I was 36 and happily married, with two healthy children and a respectable career as a poet and writer and teacher. But it felt like my world was unraveling. I found myself in a black hole; my meaning-making ability seemed to be falling apart. As I recalled the violence of a sexual assault before I was five—often feeling it in my body—I was swept up in a wave of despair. How could such a thing happen? It was hard to recognize myself. I thought I had had a safe, happy childhood, but the fractures in my own experience, the places I had not dared to go, were revealing themselves. I had had a safe, happy childhood, but that was only part of my experience, not the whole experience. The parts that had remained unnarrated in my life were emerging, and they left me dislocated. They seemed to engulf me in a terrible silence that I experienced in my head as black space and in my body as nausea. Trauma is like that: it evades narrative; it is unnamable, unsayable, where language and meaning making both fall off. Science tells us that traumatic experiences are stored in a different part of the brain from other experiences, and that connections to other parts have been blocked. That is one reason why trauma is so painful. As a writer, my crisis was both personal and professional. What was a writer to do with a story that she could not narrate? My memories were coming back to me only in bits and pieces and at first had little coherence. All I knew was that my body held the story of what had happened to me, the story that I could not put into words. I found myself facing what I feared was an insurmountable wall of silence—guarding a secret I had carried within me of a fear so scary I had not even told it to myself. Now, years later, I think that sense of not understanding my own story wasn’t the insurmountable dead end of my writing life, but instead the blank slate that my writing life had always been enticed by—though I hadn’t known it. At the center of me was some question, some unknowing that had always made me turn to writing as a way to discover, to learn, to encounter myself and the world. But for a few years that wall stopped me. I couldn’t write, let alone teach. Many writers, from Krista Tippett to Thich Nhat Hanh, talk about the transformative power of deep listening and of deep sharing. When someone gives us their undivided attention and their true, authentic self, a deep sense of value and healing is felt—both for the listener and for the speaker. Almost everyone I interviewed told me that they were putting together their story in ways they had never quite done before. In sharing their experiences with someone who cared and listened, they were able to stitch together and integrate pieces they had not narrated before. Listening to other people narrate the unspeakable also helped me break through the wall of silence that I had carried so long. As children we intuitively protect ourselves from what might expose or isolate us, and in some deep unconscious part of me, I still feared what might happen if other people knew this secret that I carried. Other people’s stories helped me see that my story was not unique, but instead part of what made me human. Paradoxically, what I had feared might keep me apart from people actually brought me closer to them. Similarly, while I had feared on some deep level that the violence had broken all meaning in my life, it became clear that what gave people’s lives meaning was not the terrible things that happened to them, but instead their creativity, resilience, determination, and love. It never occurred to me to judge the people I interviewed for the tragedies that had occurred in their lives—the death of a child, illnesses, abuse, homelessness. Instead, my respect for them grew as I listened to their stories. The meaning I could not find in my own life, I could readily see in the rich, full stories others narrated to me. And the compassion that I could not readily offer myself, I could easily offer to others. The more I listened, the more my compassion grew, and as my heart opened, the questions I asked changed; the ways in which I approached the world shifted from my head to my heart. When I first confronted my own trauma, I wanted to understand it. I kept asking why: why had this happened; how could I make sense of it; what did it mean? But while I was plagued with the question why both in my own life story and in relation to suffering on a global scale, that question seemed to soften when I listened to other people’s particular stories. Their stories did not need to be fixed, explained, or justified. Instead, they needed to be acknowledged, accepted, and shown love. I needed to do the same thing with my own story. I needed to get out of my own ego and my desire to control things and accept what had happened, show myself compassion, and recognize that my own suffering was not unique. That did not mean that my suffering was not important or that my story was not unique. Far from it; listening to other people’s stories helped me value my own story more. As I listened to more and more stories—close to a hundred—I found that the people I wanted to hear from in more detail were usually people who had a spiritual practice. One woman I learned a great deal from had gone from despair, after her first child was born with very severe birth defects, to a state of real luminosity and gratitude through her yoga practice. I also spent hours and hours over the course of a year interviewing a poet who had grown up in the Baltimore inner city, had suffered sexual abuse as a young child, had lost his first child, and had spent more than 15 years working in a factory—but was transformed by the practice of Daoism and poetry. These people and their stories had a glow and a transformative quality that I especially admired. Their own diligent practice inspired me to find and commit to spiritual practices of my own. I became a student of Thich Nhat Hanh; I trained to be a Kundalini yoga teacher. Finally, I was ready to write out my own story. The process was often difficult—I felt vulnerable and exposed. But I was held by my spiritual practices, by the healing work I had done, by the stories that had been shared with me, and by the support of my husband. I wrote my story so that it was large enough to contain both the pain and the happiness, the violence and the sense of safety, which I had feared I would never recover when I first began consciously to remember my trauma. And when I was done, I felt as if a great weight had been lifted. I no longer needed to carry my story in the same way; the page could carry it. I felt lighter in my body and in my heart. I had more freedom, more energy, more creativity. I began to teach writing again, but this time I taught in a different way. Instead of thinking of writing as product oriented, I began to think of it as more of a practice. Instead of approaching writing primarily from the questions of the head–why, how, or even what did it feel like?—I tried to bring the deep listening and compassion that I had felt when I was gifted with other people’s stories to the writing practice. I wanted to help others experience this transformative gift of understanding, accepting, and releasing their own stories onto the page—creating a world in which more authentic stories are shared. I help people come to acceptance and growth as they become their own witness. I help them open their hearts and integrate with themselves and with others so that they can write their most powerful work. I guide people to listen deeply to others (both on and off the page) so that they can then listen deeply and with compassion to themselves. And I help people listen more deeply to themselves so that they can listen with more compassion to others: this is a cyclical process. I also guide people to listen not only to their minds, but also to their bodies. We now know how much we carry our stories within our bodies; trauma, especially, which resists language, gets trapped in the body and continues to reenact itself. By bringing together yoga and writing, I help people tap into the stories their bodies are telling and bring those stories into language and consciousness. This process can bring about both emotional and physical healing. In a recent course, one student was able to largely heal a persistent throat problem through connecting her mind and body and speaking her truth. Another student experienced significant alleviation of persistent back problems when she began to listen in my course to her dreams and write from the images of the bodies that were visiting her at night. Who are we? Where do we come from? Where are we going? What is our purpose here? These are the core spiritual questions, and when we cannot answer them, our energy gets blocked. We become sick on the physical level and on the social level. We hide from life and we put up walls. Bad things do happen. But wonderful things happen as well. And in the face of bad things—of violence and pain—we have a choice either to turn away or to open, to respond, to listen and learn and grow with help and care. When we write down our stories we can look at those painful things and create something that is nonetheless beautiful. 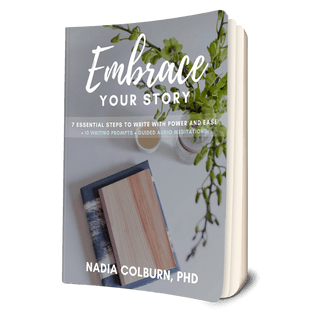 My clients often ask me: Who am I to dare to tell my story? Who am I that anyone will think my story is important? Women in particular seem to fall into this line of questioning. But as teachers like Brene Brown and Thich Nhat Hanh remind us, the more we can practice deep listening and empathy and understanding with ourselves, the more we will be able to offer them to others. So I think the question instead becomes: Who are we not to listen to ourselves, not to make sense of our own experiences, and, when we’re ready, not to share those experiences with others? So when you are thinking what to get for your loved ones—or for yourself—ask yourself whether anyone really needs that other sweater or game or gadget. Do we need more things? Consider instead the gift of a story. What if you decided to share your story with people you love? Or what if you decided to give yourself the gift of attention to your own story? What if you listened more attentively and brought not just your mind but your whole body to the experience? What if you wrote down your family’s stories so that the darkness could come out of the dusky corners into the light, and the resilience and strength could be remembered and passed on? What if you asked your uncle about his favorite childhood memory? Or told your children about a hardship that you needed to overcome? One of my students, who recently became a grandmother, is writing a beautiful book of poems about her early childhood experiences as a refugee with her Russian grandparents during World War II. It is my hope that she will publish the book and share it with a very wide audience, but at the very least, she is sharing it with her daughter—and it will be a document for her grandchildren to read and keep when they get older. When I turned to other people’s stories to make sense of my own trauma and abuse, I had without knowing it prescribed for myself the cure that Buddha prescribed for the bereaved woman who had lost her son. The story of the mustard seed goes like this: A woman lost her only son, and in her grief she would not put down the dead body and was going mad. She wanted to find a doctor who could bring back life to her dead son. Finally someone brought her to the Buddha. Can you revive my son? she asked him. Yes, he said. If you bring me a mustard seed from a house that has not experienced death, I can revive your beloved son. The woman went from house to house, but every house had experienced the death of a loved one. On and on she went, looking for a house not touched by death, loss, and tragedy. But in each house, she heard another story of loss. Finally, she understood, and put down the body of her child.